The NZSCA would like to recognise and acknowledge the individuals within New Zealand that give back to the industry, without these individuals we would not be where we are today. Chris’s ongoing support of the NZ coffee championships since 2001 has been outstanding, helping mentor those new to the coffee industry, judges & baristas alike, not only nationally but internationally. Supporting the NZSCA through several board positions since the formation of the association in 2005 and ongoing support of events through sponsorship and also venue support. Always in the shadows always supportive. We thank you Chris! This is an award for an individual in recognition of their outstanding on-going contribution to the NZSCA and the NZ Coffee industry as a whole, they have consistently dedicated time and knowledge to make a lasting impact on the industry and the association. These contributions may include but are not limited to dedication of time, volunteerism, contributions of professional knowledge, exemplary work on a specific NZSCA project, or other notable contribution. Importantly, the contributions should be above and beyond the everyday and have had a long lasting impact on the NZ Industry as a whole. Rene’s award goes for recognition of the hard work and commitment he has put in to develop the nationwide workshops for the roasters guild over the last 18 months. Rene is an extremely knowledgeable coffee professional and he is all about sharing that knowledge and adding value throughout the supply chain, from working closely with farmers to sharing his expertise with baristas. 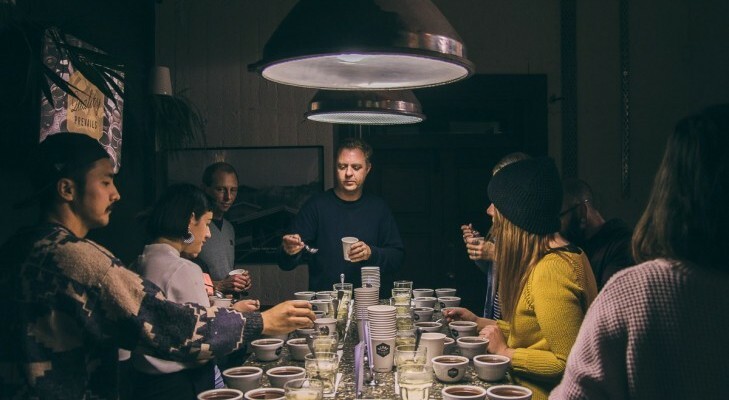 Rene has committed a huge amount of time and effort into developing a series of fun, interactive and educational coffee sessions that have added real value to our industry. A committed ambassador for our industry and association, thanks Rene! This is an award for an individual in recognition of their contribution to developing the NZSCA and the NZ Coffee industry as a whole. These contributions may include but are not limited to dedication of time, volunteerism, contributions of professional knowledge, exemplary work on a specific NZSCA project, or other notable contribution. Michaels award is in recognition of the years of photographing NZSCA events. His ability to capture a moment in time is amazing. Since coming along in 2012 to a workshop in Auckland Michael has captured many of our championships, workshops, AGM’s and Symposiums. Allowing us to use his images throughout all our media channels. He makes us look good. Always smiling always happy. We thank you Michael! This is an award for an independent individual in recognition of their personal contribution to the NZSCA.